This article is about human anatomy. For the game developer, see Human Head Studios. For other uses, see Head (disambiguation). 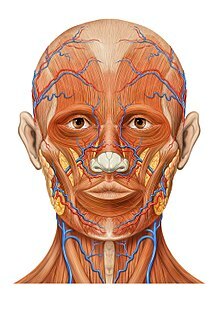 In human anatomy, the head is at the top of the human body. It supports the face and is maintained by the skull, which itself encloses the brain. The face is the anterior part of the head, containing the eyes, nose, and mouth. On either side of the mouth, the cheeks provide a fleshy border to the oral cavity. The ears sit to either side of the head. The twelve pairs of cranial nerves provide the majority of nervous control to the head. The sensation to the face is provided by the branches of the trigeminal nerve, the fifth cranial nerve. 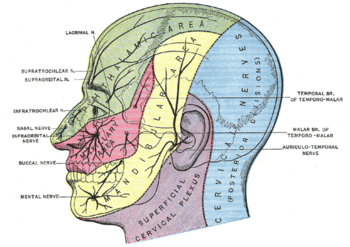 Sensation to other portions of the head is provided by the cervical nerves. Modern texts are in agreement about which areas of the skin are served by which nerves, but there are minor variations in some of the details. The borders designated by diagrams in the 1918 edition of Gray's Anatomy are similar but not identical to those generally accepted today. The head contains sensory organs: two eyes, two ears, a nose and tongue inside of the mouth. It also houses the brain. Together, these organs function as a processing center for the body by relaying sensory information to the brain. Humans can process information faster by having this central nerve cluster. For humans, the front of the head (the face) is the main distinguishing feature between different people due to its easily discernible features, such as eye and hair colors, shapes of the sensory organs, and the wrinkles. Humans easily differentiate between faces because of the brain's predisposition toward facial recognition. When observing a relatively unfamiliar species, all faces seem nearly identical. Human infants are biologically programmed to recognize subtle differences in anthropomorphic facial features. People who have greater than average intelligence are sometimes depicted in cartoons as having bigger heads as a way of notionally indicating that they have a "larger brain". Additionally, in science fiction, an extraterrestrial having a big head is often symbolic of high intelligence. Despite this depiction, advances in neurobiology have shown that the functional diversity of the brain means that a difference in overall brain size is only slightly to moderately correlated to differences in overall intelligence between two humans. The head is a source for many metaphors and metonymies in human language, including referring to things typically near the human head ( "the head of the bed"), things physically similar to the way a head is arranged spatially to a body ("the head of the table"), metaphorically ("the head of the class"), and things that represent some characteristics associated with the head, such as intelligence ("there are a lot of good heads in this company"). Headpieces can signify status, origin, religious/spiritual beliefs, social grouping, team affiliation, occupation, or fashion choices. In many cultures, covering the head is seen as a sign of respect. Often, some or all of the head must be covered and veiled when entering holy places or places of prayer. For many centuries, women in Europe, the Middle East, and South Asia have covered their hair as a sign of modesty. This trend has changed drastically in Europe in the 20th century, although is still observed in other parts of the world. In addition, a number of religions require men to wear specific head clothing—such as the Islamic Taqiyah (cap), Jewish yarmulke, or the Sikh turban. The same goes for women with the Muslim hijab or Christian nun's habit. A hat is a head covering that can serve a variety of purposes. Hats may be worn as part of a uniform or used as a protective device, such as a hard hat, a covering for warmth, or a fashion accessory. Hats can also be indicative of social status in some areas of the world. While numerous charts detailing head sizes in infants and children exist, most do not measure average head circumference past the age of 21. 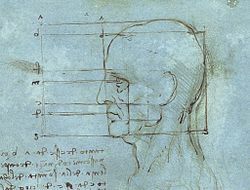 Reference charts for adult head circumference also generally feature homogeneous samples and fail to take height and weight into account. Macrocephaly can be an indicator of increased risk for some types of cancer in individuals who carry the genetic mutation that causes Cowden syndrome. For adults, this refers to head sizes greater than 58 centimeters in men or greater than 57 centimeters in women. Static adult human physical characteristics of the head - redrawn. ^ "Infants process faces long before they recognize other objects, Stanford vision researchers find". Stanford University. Retrieved 2018-11-14. ^ Pallett PM, Link S, Lee K (January 2010). "New "golden" ratios for facial beauty". Vision Research. 50 (2): 149–54. doi:10.1016/j.visres.2009.11.003. PMC 2814183. PMID 19896961. ^ Nguyen, A.K.D (2012). "Head Circumference in Canadian Male Adults: Development of a Normalized Chart". International Journal of Morphology. 30 (4): 1474–1480. doi:10.4067/s0717-95022012000400033. ^ Bushby KM, Cole T, Matthews JN, Goodship JA (October 1992). "Centiles for adult head circumference". Archives of Disease in Childhood. 67 (10): 1286–7. doi:10.1136/adc.67.10.1286. PMC 1793909. PMID 1444530. ^ Mester JL, Tilot AK, Rybicki LA, Frazier TW, Eng C (July 2011). "Analysis of prevalence and degree of macrocephaly in patients with germline PTEN mutations and of brain weight in Pten knock-in murine model". European Journal of Human Genetics. 19 (7): 763–8. doi:10.1038/ejhg.2011.20. PMID 21343951. Wikimedia Commons has media related to Human heads. Campbell, Bernard Grant. Human Evolution: An Introduction to Man's Adaptations, 4th edition (ISBN 0-202-02042-8).